Maximum desktop thickness 1 3/4"
How does the Hanging Storage Cubby install to my desk? Do I need any screws or anything? Installing this storage cubby is more than easy. There is no assembly, just unbox the cubby and slip it onto the edge of your desk, on the side where it's within easy reach. How does the cubby work to increase my desk storage at my sit-stand desk? We think you'll agree that the 7.1" W x 13.6" H x 14" D deep storage space on the Hanging Storage Cubby is large enough to store some of your most-used items, like laptops, notepads, and even purses and briefcases. A durable fiber padding on the top and bottom storage areas halts scratches and dings, so you'll be able to insert and remove your things with no issue. The upper compartment is sized to hold smaller things, like phones, wallets, and keys. And the whole unit rests reliably on your desk, so when you raise and lower it, the cubby comes with you! Will the cubby still fit on my desk if I have a keyboard tray installed? This depends. If you have a keyboard tray, you will need at least a 48" long desk if you plan to install the cubby on your desktop. Give us a call if you have any questions about your particular configuration. What kind of things go in the Hanging Storage Cubby? 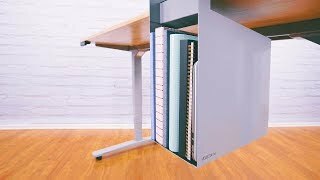 Show your desk clutter who's in control with a hanging under-desk storage solution that is sized to hold laptops, tablets, 3-ring binders, and even purses and smaller briefcases! And give your smaller or more delicate personal items, like your phone and wallet, a soft new home on the cubby's padded upper storage area. How stable is this once it's on the edge of my desk? Will it fall off? Although the Hanging Storage Cubby doesn't require any screws or assembly, it's extremely solid and counterbalanced, well so there is almost no chance that it would come off of your desk, even when adjusting. When you go to add or remove items, the cubby stays put, so you don't have to worry about it coming off or falling onto the floor. Yes, the Hanging Storage Cubby comes with three color options - white, black, and gray finishes. Coordinate the Hanging Storage Cubby with your office accessories and your desk in white, black, or gray.